“Where the rubber meets the road” is an expression for automobile tyres as they are the most critical element of your car. When you hit the road, the tyres are in constant contact with the road surface, generating a lot of friction. Ensuring the maximum efficiency in tyres is directly proportional to tyre pressure. It can save your life and even let your vehicle run with great fuel efficiency. Considering this, it is highly important to maintain the correct air pressure in the tyres. Many car owners are not aware about the importance of maintaining the optimum tyre pressure and the numerous reasons for the tyre pressure to matter. WHY TYRE PRESSURE MATTERS? The correct tyre pressure is crucial for safety even while driving on the toughest terrains. A tyre with incorrect pressure can affect braking, car handling, fuel economy, and longevity of the tyres. 1) Road Safety Regulations: Generally, in most parts of Australia, it is an offence to drive with damaged or worn out tyres. Almost 90% of all Australians do not know that the required legal minimum tread depth for tyres is 1.5 mm. Anything below the standard limit means that the driver can be charged with illegal and unsafe tyre conditions. 2) Fuel Efficiency: Under inflated tyres can use up to 0.3% more fuel per 1 psi drop in tyre pressure. So, keeping the tyre pressure in check is the best solution to improve fuel efficiency and save on the fuel consumption. 3) Road Safety: Defective tyres and incorrect tyre pressure cause 1 in 10 of the fatal road accidents. 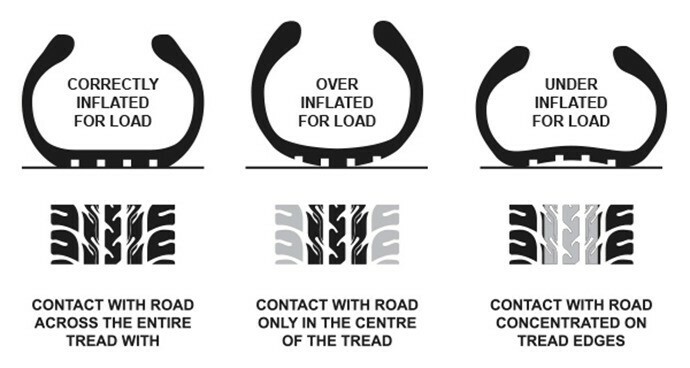 Under inflation of tyres or over inflation of tyres can have negative effects on road safety. In any case, faulty tyre pressure leads to reduced tyre footprint, increased damage to tyres, increased risk of hydroplaning under wet atmosphere, a stiffer ride, reduced fuel economy, decreased cornering stability, loss of steering precision, damaged suspension or increased chances of complete tyre failure. WHAT IS THE CORRECT PRESSURE AND HOW TO FIX IT? The tyre pressure matters a lot for the overall operation of the car. Under regular driving conditions, normal tyres tend to lose 1 psi/month. Considering this, it is highly recommended to get the tyre pressure checked by certified technicians at least once a month. Additionally, the car manufacturer manual has detailed specifications about the tyre pressure requirements for your vehicle. The correct air pressure for the tyres is also listed on the tyre placard attached to the vehicle’s door edge, fuel door, glove box door doorpost. If you aren’t comfortable in checking the tyre pressure yourself, Car Tyres & You is your local car service centre. Our certified technicians and professionals will never let you get disappointed with a flat tyre!